One of the most important parts of your refrigerator is its door. If the door doesn’t close properly or if the seal comes loose, cold air escapes so it becomes much harder for the compressor to keep up and maintain the cool temperatures needed to keep your food safe to eat. If you notice that your refrigerator door is bouncing back from the frame of the refrigerator or if the seal is coming loose or if you simply notice that there is an excess of frost or ice in and around the door, call All Time Services right away. 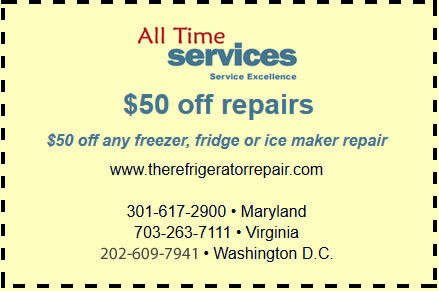 We’ve been solving refrigerator door problems in Virginia , Maryland and the greater Washington D.C. area for years and we can have your fridge back working as it should in no time. These of course can be signs of other problems too, but in many cases, basic door seal or hinge service will take care of it. In either case, if these problems occur, call us right away for professional inspection. Once the problem has been identified, one of our repair experts will determine what the best option is to repair your refrigerator door. In many cases, a missing spacer is the culprit, usually broken off during a move or when working on the kitchen. Other problems may include door gasket failure or actual warping of the refrigerator door. In any case, key parts in the door will most likely need to be replaced. This should only be performed by one of our trained professionals who can make sure the seal is good after the repair. Whatever the symptoms and however severe they are, it’s important to call a professional the moment you notice a problem with your fridge door. 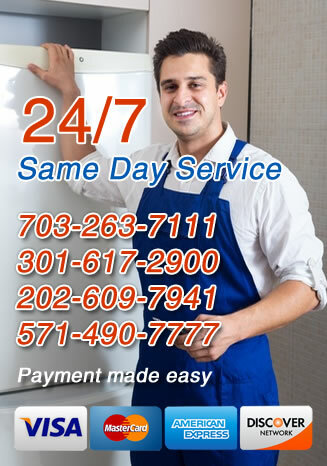 For fast and professional service in Arlington, Virginia, Gaithersburg, Maryland and the surrounding areas, call All Time Services today for professional refrigerator door repair.